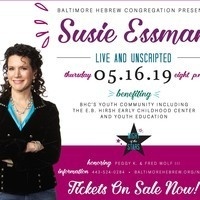 Comedian, actress, writer and television producer SUSIE ESSMAN, will appear LIVE AND UNSCRIPTED at the 9th Annual Night of the Stars at Baltimore Hebrew Congregation (BHC). She’s blown us away as the strong-willed Susie Greene in HBO’s long running series “CURB YOUR ENTHUSIASM.” She made us laugh on comedy central’s “BROAD CITY” as Bobbi Wexler who lives on Long Island and loves high quality knock-off handbags. The event will take place on Thursday, May 16, 2019, 8 PM in The Dalsheimer Theater at Baltimore Hebrew Congregation and benefit BHC’s Youth Community. Honorees are community leaders and long time BHC congregants Peggy K. and Fred Wolf III. Seats are $65 - $215. Premium tickets include Cocktails and Supper prior to the show. For event information and tickets go to www.baltimorehebrew.org/nots. Or call 443-524-0284.